Embrasures- You know you love walls with holes to shoot through. You can research fire resistant, reinforced and fire resistant reinforced embrasures. Medicine Kit Crafting- No more will your colones have to do without bandages. 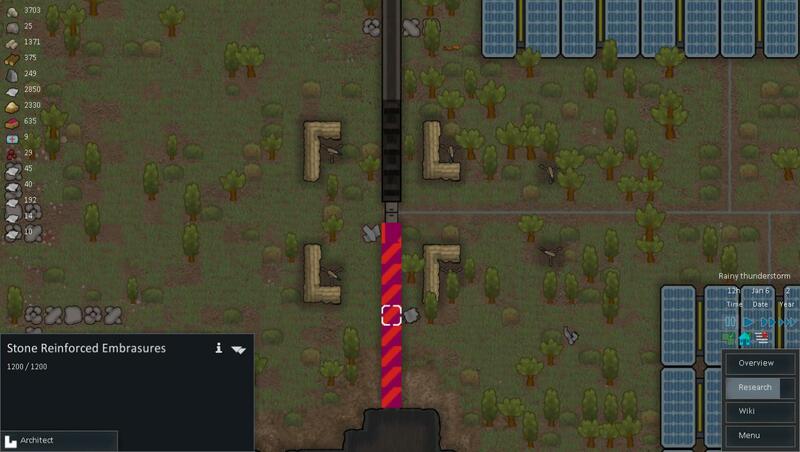 MIRV Artillery- Why shoot one projectile down range when you can shoot three? You will need to research this. Weapon Crafting- If you have the time, skill and resources you can build most of the firearms in the game. Organ Replacement Production- If you have the time, skill and resources you can grow replacement organs in the game. BionicReplacement Production- If you have the time, skill and resources you can build bionic replacements in the game. Neurotrainer Production- If you have the time, skill and resources you can build neurotrainer joywire painstopper and AI persona core in the game. Armor Production- If you have the time, skill and resources you can build Armor in the game. NonDecayingStorage- Do you dislike how untidy your stockpiles are? Now you can add shelving (preconfigured). Training Rack- They say knowledge is power, but how do you get that knowledge? With the training rack thats how. Use scrap material to learn how to do thing or better yourself. Temperature Control- A fan to keep you colonists cool. Cyclone Wire- Cyclone wire, razor wire, trenches, and razor wire traps to keep you enemy a bay. Agriculture- Soil that you can place that has better fertility them basic soil. Permissions: Anyone may use my mods for their modpacks, youtube series, or anything along those lines. All I ask of you is that you give me a link to where you are using my mod by pm me. I also ask that you do so with out a fee (excepting youtube Let's Plays). I will list the modpacks that use this mod on this forum post unless asked otherwise. 1.6.2 update to Beta 19. 1.6.1 update to Alpha 18. 1.5.16 fixed time to build. 1.5.14 adjusted flammability of cyclone wire and trenches. 1.5.13 added tab for stand alone training racks and updated the graphic on Agriculture. 1.4.5 Updated to Alpha 10 all normal weapons can be constructed. 1.4 Updated to Alpha 10 most of the weapons can be constructed still working on it. I take it that the reinforced embrasures are not supposed to look like that? Other than that they are pretty good. Got your link draw type wrong? linkDrawerType is set to CornerFiller. What should it be set to? basic does not work. I believe that I fixed the problem. Man, some of use are going to have fun with this (Zeta Omega, if that's his name.) Can you post some pictures of the droids? I assume you would need to change it for the other 3 xml files for each type. I have no clue what I'm doing but when I looked over an older mod with walls I saw it was Graphic_Single. I don't know what the difference between appearances and single is, or if it's doing something else. But with the change it works. I was basing it on walls in the core. Thank you for your help. Appearance does the plank/smooth/stone pattern on the walls. If you havent defined which one you want in the xml you should...itll then take on that pattern when made from stuff. I do not see what is causing it unless it is being carried to be set up.